The annual Duffers Classic is a fun morning on the golf course to support the Oregon Nurseries' Political Action Committee (ONPAC). Your support will help us elect legislators on both sides of the aisle who understand the nursery industry. If you are interested in the promotional opportunities associated with sponsorship and you want to support ONPAC and its legislative agenda, please contact Allan Niemi at 503-582-2005 / aniemi@oan.org, or send payment along with this form directly to the OAN (29751 SW Town Center Loop W, Wilsonville, OR 97070). All sponsorships sold on a first-come, first-served basis. Hole-In-One Sponsor (Qty 1): $850. 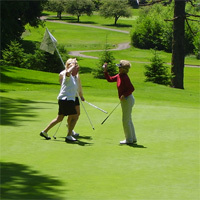 Receive benefits listed below plus two complimentary golf registrations ($250 value) and verbal recognition at awards. Prize sponsors shall provide $350 or an approved promotional item for all player gift bags (approximately 150 items). Examples of approved promotional items include golf towels, golf tools, sleeves of golf balls, water bottles or snack items. If you are interested in the promotional opportunities associated with sponsorship and supporting ONPAC and its legislative agenda, please contact Allan Niemi at 503-582-2005 / aniemi@oan.org, or send payment along with this form directly to the OAN (29751 SW Town Center Loop W, Wilsonville, OR 97070). All sponsorships sold on a first-come, first-served basis.